We are a nationwide holiday and travel law firm with a proven and unrivalled record of achieving outstanding results for our clients. Our team of professionals include solicitors and lawyers with more than 80 years' combined experience winning compensation for holidaymakers who have fallen ill or have been injured abroad. Have you been the victim of an accident or illness on holiday? If you have been a victim of illness abroad or an accident whilst on holiday you could be entitled to substantial compensation. Our dedicated team of personal injury lawyers offer a free advice service and can help you to start your compensation claim today. 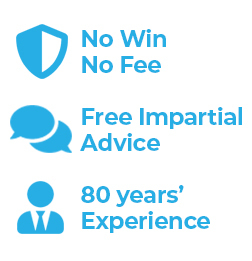 Why choose Simpson Millar to help you? Win and receive your compensation. Lose and you won't pay a penny!